This soup was a revelation for me. A few days ago I mentioned that I was falling for dried chiles this year. This dish was phase one of the seduction. 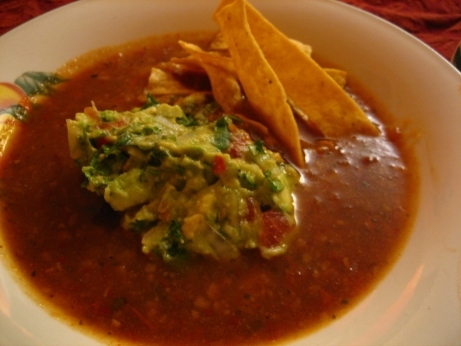 In this recipe a pretty standard soup base (stock water, onion, tomato, garlic, oregano, salt and pepper) is transfigured into one of the more delicious things I’ve ever tasted with the addition of two ancho chiles, and two guajillos. The soup becomes rich and thick when corn toritllas are fried crisp, and crumbled into the soup. This dish would be delicious if you stopped here, but it gets so much better with the addition of the avocado relish. This relish is a much better guacamole than The Book’s official guacamole recipe, and it compliments the soup perfectly. Everything that is deep sultry and comforting and warm in the soup is bright, clean, shining and crisp in the relish. The soup has a satisfyingly hearty texture, which is mirrored in the relish. A few fried tortilla strips added just before serving give a nice crunchy counterpoint. The recipe suggests that you fry your own corn tortillas, but as the tortilla place in my neighborhood does this on site I just bought a bag of their fresh made tortilla strips, and saved myself the trouble. This recipe came together easily, and was completely delicious. I thought the final presentation was very attractive, and the dish just made me happy. This soup absolutely earned its five mushroom rating. Gasp! Kevin singing the praise of a garlic-less guacamole! Can it be?! It’s a garlic-less avocado relish, that paired nicely with the 6 cloves of garlic in the soup. I would of course add garlic to the relish if I was serving it as guacamole. We still need to have our guacamole off. When are you in Montreal? You really sold me on this recipe, by the way– I’m going to try it out as soon as I have a kitchen again. I agree this soup was good, though it was not the second coming of Christ, as you seem to think it was. Nope, it was the first coming of Ancho chiles. Sounds delicious, but I personally take my tortilla soup with fresh slices of avocado and lots of fresh lime juice squeezed directly into the soup to taste. Must go to bed and stop reading your blog, it’s making me hungry!